Opinion: The Strange Silence Over China's Muslim Crackdown NPR's Scott Simon reflects on the world's inattention to China's crackdown on Uighurs, Kazakhs and other Chinese Muslims. 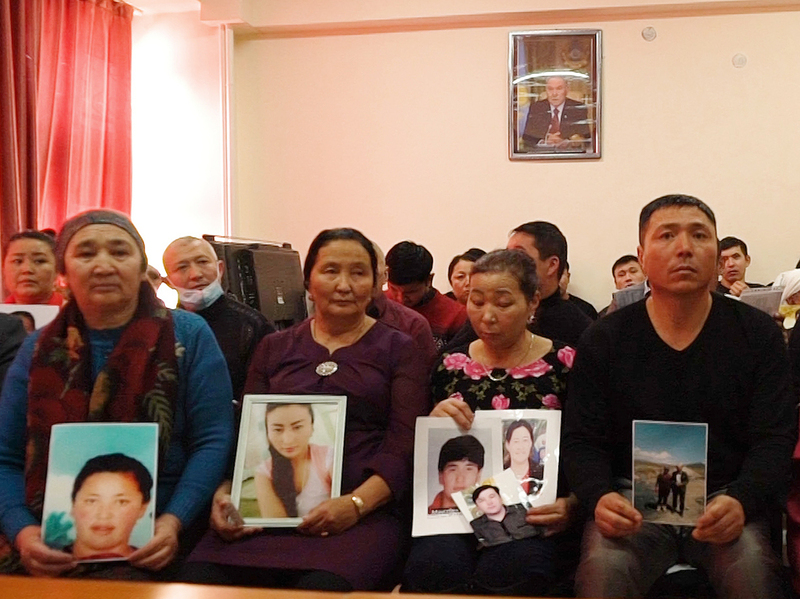 In this Dec. 7, 2018, relatives of people missing in China's far western region of Xinjiang hold up photos at an office of a Chinese Kazakh advocacy organization in Almaty, Kazakhstan. President Trump says trade talks between the United States and China have been, "going very well." The United States put $250 billion worth of tariffs on Chinese goods last year, to counter what it considers unfair trade practices and theft of U.S. technology. But there are no indications the United States, the United Nations, or any government is prepared to use any economic or diplomatic leverage to oppose China locking up between 800,000 and 2 million Uighurs, Kazakhs and other Chinese Muslims into internment camps in the western Xinjiang region. The camps are in remote locations — closed to the world — and ringed with barbed wire. But they have been photographed by satellite. The Chinese government calls them "re-education centers," a phrase that carries a sinister history from the murderous purges of Mao Zedong's Cultural Revolution. The people in the camps are forced to denounce their faith and pledge loyalty to the Communist Party. According to multiple reports, a number of people in the camps have also been tortured. As Sophie Richardson, China director at Human Rights Watch, told The Independent, "If any other government in the world was locking up a million Muslims I think we can reasonably expect to have seen demands for a debate at the U.N. Security Council or an international investigation. That's generally unlikely to happen with China." There were calls in the U.S. Congress last fall for the Trump administration to consider sanctions against China for what Secretary of State Mike Pompeo denounced as "awful abuses." But China is America's largest creditor: it holds more than a trillion dollars in U.S. Treasury securities. Look down at whatever you're wearing, carrying, riding in or working on right now. American businesses get rich relying on Chinese workers who earn low wages to produce our clothing, mobile phones, building materials, and dazzling new tech devices. The Trump administration imposed tariffs on China over unfair trade practices. But it has offered no more than a few rhetorical flourishes over human rights crimes. Neither did the Obama administration, or the European Union. And Muslim countries — including Saudi Arabia and Iran — have been similarly, conspicuously, silent. China invests heavily, and strategically in their nations too. Sometimes, the price of human rights just cannot compete.